The Health structure is divided into divisions, which are responsible for coordinating the various activities of the IZSVe, deparments, located at the IZSVe headquarters, and peripheral diagnostic laboratories, distributed throughout north-eastern Italy. This division controls the food/feed production chain in order to monitor health risks associated with consumption; it also schedules and conducts regular controls on the safety, quality, and hygiene of foods/feed. This division coordinates the activities performed by the IZSVe’s facilities who employ laboratory animals. It provides researchers with adequate information in compliance with the provision of the European and Italian law, in relation to the animal welfare and the ethical principles associated to the use of animals for experimental purposes. This division provides adequate diagnostic services, surveillance, counseling, assistance and research for the control of animal diseases and for the protection of public health. This division implements the vision of “One Health” for the study, diagnosis, control and prevention of viral diseases of animals and those transmitted to humans directly or indirectly. This division is responsible for ensuring control and monitoring of the territory against infectious diseases transmissible from animals and zoonoses, with reference also to foodborne diseases. This department provides technical-scientific support for risk analyses and production-line control programs/systems. In particular, it performs epidemiological surveillance for the hygiene of foods of animal origin and experimental studies on the health risks related to the consumption of foods of animal origin. This department provides technical-scientific support for food-safety programs, in particular: official food controls, regional monitoring programs, veterinary pharmacovigilance, and the study and testing of technologies and methods for controlling the safety of foods of animal origin and animal feed. This department provides specialised diagnostic services, in particular: diagnosis of animal diseases and zoonoses, epidemiological surveillance in animal health, development and application of alternatives to the use of animal models in research, experimental veterinary research. This department develops and promotes the use of epidemiological methods in public veterinary health. It is the headquarters of the Regional Centre for Veterinary Epidemiology (CREV), which acts as liaison between the veterinary facilities in the area and the IZSVe. This department is responsible for the creation of knowledge and skills through scientific research and technological innovation, in particular: research on viral zoonoses and emerging and re-emerging pathogens, innovative diagnostic and applied research. This department aims to respond properly to the needs of animal health and public health in creating a system of specialized diagnostic and experimental research for viral diseases. This department promotes the development of the IZSVe by managing information processes and through technical-cultural renewal, through the planned management of communication, using information tools and organising specialised training in zooprophylaxis provided to the personnel (also at institutes and laboratories in other countries), and the organisation and management of a centralised reception, which represents a fundamental like for the receipt and shipment of samples and outcomes and of interface with users. This department provides technical-scientific support for food-safety programs, in particular: official food controls (tests/analyses on foods of animal origin); experimental veterinary research in food microbiology; and improving hygiene in food-production. This area includes three laboratories which perform clinical diagnoses, official food controls, molecular biology analyses, serology, and clinical bacteriology analyses. This area includes laboratories which perform clinical diagnoses, official food controls, molecular biology analyses, and serology. This area includes four laboratories which perform clinical diagnoses and activities related to fish pathologies. This area includes two laboratories which perform clinical diagnoses, official food controls, molecular biology analyses, and serology. This area includes three laboratories which conduct diagnoses, official food controls, serology, and microbiological and chemical own-check/self-certification/self-control activities. This area includes three laboratories which perform clinical diagnoses, official food controls, serology, and molecular biology analyses. The Specialist aquatic animal health centre functionally coordinates the activities of the various laboratories dealing with aquatic animal health, performing the functions of National reference laboratory for fish, crustacean and mollusc diseases. The office coordinates the laboratories and operational units that directly and indirectly refer to the CRN, ensuring correct performance of both specific CRN functions and diagnostic and technical/ scientific support activities for community-based services and the productive sector. On June 15, 1929, the IZSVe was inaugurated in Padova, as the result of an initiative of provinces in the Triveneto area, whose objective was to establish a scientific-experimental centre that would provide zootechnical support to stakeholders in the area. The history of the IZSVe has involved a group of individuals, including directors, presidents, and health, technical and administrative personnel, who have remained dedicated to their work throughout the 20th and 21st centuries, from the difficult war years to the post-war recovery, from the economic boom of the 1960s to the birth of the research activities in the 1970s, and from the beginnings of Europe’s free market to the new challenges posed by globalisation. Eighty years later, the promotion of public health and animal health continue to represent the main objectives of the IZSVe, which has succeeded in meeting its objectives thanks to a team of individuals whose extraordinary commitment has allowed the IZSVe to build a future characterised by innovation, quality, knowledge, and scientific expertise, allowing it to make a true difference at the global level. On June 15th, the the Stazione Sperimentale delle Tre Venezie was created on the outskirts of Padova by the provinces of Belluno, Bolzano, Fiume, Padova, Pola, Rovigo, Trento, Treviso and Vicenza, with other provinces adhering to the initiative in later years: Verona in 1929, Trieste and Venezia in 1931, Udine in 1932, Gorizia in 1937, and Ferrara in 1950. The first activities of this Institute included the diagnosis of livestock diseases, experimental research, teaching activities, and the dissemination of technical-scientific information, with the objective of responding to the needs of stakeholders in the area. In 1941, the Institute began to produce a vaccine for epidemics of foot and mouth disease in the bovine population; vaccine production continued until 1991, when it was suspended following the issuing of EC legislation on disease control. The Institute also began activities in food bacteriology, which over the years would become fundamental for food safety. In 1950, the Tori Centre for the artificial fecundation of cattle was created with the objective of treating and preventing infectious sterility. In the post-war period, the areas of avian pathologies, virology, and serology were among the first specialised areas to be developed. 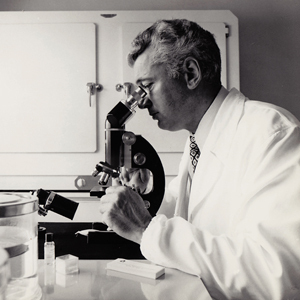 In 1958, new virology laboratories were constructed for the purposes of tissue cultivation and vaccine production. In this period, peripheral diagnostic facilities were built in Udine (1950), Verona (1950), Belluno (1955), San Donà di Piave (1955), Vicenza (1956), Adria (1956), Treviso (1956), Bolzano (1957), Trento (1960), and Pordenone (1967). In addition to the Institute’s increasing focus on peripheral areas, there emerged new interest in minor species, such as rabbits, and in wild fauna, as well as specialised activities, such as beekeeping, rabies and illegal treatments given to cattle used for meat production. In an overall context of technological and productive development, the Institute developed major technological and methodological innovations, especially in the areas of virological research and the control and prevention of infectious animal diseases. In 1970, the passing of legislation on the reorganization of the IZSVe determined the new direction that the Institute would take, which are now part of the National Public Health. In this period, major developments were made in the agro-industrial system, with a simultaneous increase in scientific knowledge. The IZSVe launches an intense phase of redevelopment of its activities with chemical, bacteriological, and virological laboratories. As a result of the consolidation of the laboratories of the IZSVe, in 1980 the research activities begin to. In 1990, the Veneto Region established CREV (Regional Centre of Veterinary Epidemiology) at the IZSVe. IN 1993, legislation on the reorganization of the IZSVe redefined its structure, responsibilities and functions. This legislation acknowledged two fundamental elements of the reform of the National Health System, in particular, the decentralisation of responsibilities, with a shift towards the regional level, and the process of privatisation of public health facilities. In this period, the epidemics of avian influenza in the western part of the Veneto Region, in particular in the province of Verona, led to intensive research activity and resulted in the IZSVe gaining international attention, with diverse recognitions of excellence. In 2006, following a restructuring, the services and research activities of the IZSVe began to be increasingly focused on health issues of international importance. In the same year, the Global Initiative for Sharing All Influenza Data (GISAID) was created, a public database for the transparency of data and the free exchange of genetic information with the international scientific community. New diseases and the safeguarding of public health: the IZSVe faces the challenges of the major health issues of globalisation. Relations are strengthened with stakeholders in the area (e.g., institutions, production categories, consumers), so that the IZSVe can act as a leader at the national and international level, allowing it to adequately safeguard public health and satisfy emerging needs. Venice’s “Marco Polo” International Airport is approximately 30 km from Padova. There is a public bus service from the airport to Padova, which takes approximately 1 hour. The bus stop is on your right as you exit the airport from the arrivals hall. Buses are marked “SITA” and tickets (which cost approximately €4) can be either purchased in the airport (at the ATVO agency in the arrivals hall) or on the bus itself. Get off the bus at the end of the line in Padova’s main bus station (Piazzale Boschetti). To reach the IZSVe, you must take another SITA bus from Piazzale Boschetti to Agripolis (approximately 30 minutes). There is only one railway station in Padova which is served regularly by trains from most major Italian cities (e.g., Milan, Verona, Bologna, Rome). www.trenitalia.com. Information (7.00 am – 9.00 pm) – Telephone: (+39) 049 8224456. To reach the IZSVe from Padova’s train station, you must take a SITA bus to Agripolis (approximately 30 minutes). The bus stop is directly outside the train station. Tickets (approximately €3) can be bought in the ticket office in the train station’s arrivals hall or on the bus itself. When buying tickets, please specify Agripolis as your destination. Ask the driver to let you off at IZSVe or, when you get to Agripolis, which is the final stop, walk back about 100 metres to the previous stop, which is directly outside the IZSVe. You will find taxi stands at Padova’s train station and in the city centre. The cost of a ride from the train station to the IZSVe should be between €20 and €25, depending on traffic. If you need a taxi you, can call the Cooperativa Radio Taxi Padova – Telephone: +39 049 651333. Exit “Padova Est”. Once you have taken the exit, you will enter a roundabout; follow signs for Ravenna/Chioggia/Adria; continue on this road for approximately 5 km (tangenziale Corso Argentina). Take the fourth exit, following signs for Chioggia; at the traffic light, turn left. Once you have passed the developed area Roncaglia and the bridge of the developed area of Ponte San Nicolò, continue in the direction of Legnaro/Piove di Sacco. Once you have gone over the overpass over expressway A13, at the first traffic light turn right and follow signs for the Istituto Zooprofilattico, which is approximately 1 km from the traffic light. Exit “Padova interporto”. At the roundabout, after the exist, turn left. At the first traffic light (which is approximately 500 meters away), turn left in the direction of Ponte San Nicolò; after approximately 1.5 km, at the overpass of the waterway, turn left in the direction of Legnaro. Keep to the right, along the water way for about 500 meters. Turn right before crossing the underpass of Expressway. Continue for approximately 1.5 km and at the junction take the exit for Legnaro. At the first traffic light, turn right and follow signs for the Istituto Zooprofilattico, which is approximately 1 km from the traffic light.